Jinger and Jeremy Vuolo spent the weekend in Atlanta, Georgia, attending and speaking at the G3 Conference. They stopped by The Varsity, an iconic Atlanta fast food chain, for a meal. Have any of you been to The Varsity? Family owned and operated since 1928, it is branded as the world's largest drive-in restaurant. Love seeing this couple. How is Jinger doing with her pregnancy? Whata ya have, whata ya have? Could have been "G'day mate, whatta ya have." Oh to be a Duggar and to get to travel extensively. Do people who eat at the Varsity HAVE to wear those paper hats? Their lives are so different now being rich and famous. Just think of how they started out in that tiny house. They seem more into drawing attention to themselves than when they first were on TV. I heard about this restaurant via the Food Network and have always wanted to go there. If we ever make it to Atlanta, that's going to be our first stop. When we lived just south of Atlanta we went there several times!! SO GOOD!!! You have to get a frosted orange when you go. and everyone has to wear a hat!!! I wouldn't wear a hat even if they were giving food away. I'd wear a hat for free food! Everything in fast food places smells of grease. I wouldn't put that hat on my head, either. Never heard of the Varsity. Nice couple. But why do so many photos have to be staged and with false wide open eyes? Sometimes the big thing artificially wide open mouths. They are much better with just a natural smile. All photos that are not candid are staged, there picture is adorable, why criticize it? Jill does the same wide-eyed look too. Yes! I live in the outskirts of Atlanta. The Varsity is a classic! The chilli dogs with onions are my favorite treat. Although I don't get it very often! They are so cute. I think its awesome they spoke at the G3 conference. Hope you had a good time in Atlanta Jinger and Jeremy! Hi, I live in Atlanta and have been waiting for the Duggars and extended family to visit the area. Sad to see that They visited and I missed it. I usually jeeo an eye on upcoming events. Was their Atlanta trip announced somewhere and I missed it? Where is the best place to see upcoming events and locations? Yes, It has the best dogs and they shout "Whatta you have" to every customer. I went there years ago when I was in college. Fun! Just to rectify - This family is not known worldwide...Or at least not in the E.U. Did you read the paragraph in this post? Just to rectify. It never said the family is known worldwide. "Family owned & operated since 1928, it is branded as the world's largest drive in restaurant." No mention of the FAMILY being known world wide. It would help if people read the post before making unsubstantiated comments. Anon 7:54 is right. Aside from some ILBP speaking engagements, I can't see too many people abroad caring. The Duggars are 'reality' (scripted reality) 'stars'. In other words not much more than a game show. I agree. Here, in Canada, it is only those who watch TLC and many people do not. Read the description people very sloowly. It does not say the family is known worldwide. Just to rectify! Where did anyone say they were known worldwide? Not seeing that anywhere on this post or in the comments (and did you mean clarify rather than rectify?). 7:31, Every scene we see on the show is carefully filmed, edited, set up in advance, rehearsed, shot several times, and yes, "scripted" in a way. If you pay attention, you can see where the editing cuts were made for the different takes, as people and things in the background change places, glasses that were full are now half-empty, animals have moved, etc. The result is their not-so-real version of reality. Imagine if we all had 3 or 4 takes for everything in our lives! I haven't eaten fast food in 30 years, so no, I wouldn't eat there. All that salt and fat, yuck. I don't eat at fast food places either. Not only is the food gross and bad for you, but the sanitation practices turn me off. I lovveee a good fast food burger n fries, yummm! Wow 9:41, you're extremely rude. Love the varsity, yummy food, but it’s a heart attack in the waiting. You need to get the frosted orange or PC (pure chocolate milk served over crushed ice) to cut the grease. It’s “what’ll ya have” it is a southern thing. lol. Iconic everyone should visit, but to age myself it’s not like it use to be. Biggest draw was going into the car hop area and having the guy sing the menu (forget his name). It’s huge, covers two city blocks. I hope they didn't film them trying to cook, with instructions from the chef. 10:05 have you ever realise that some part of the world do not speak English ? It means language mistake can happened ! Plus Duggars or that restaurant are not known by all of us across the world. Sorry ! Congratulations to both of them, they are in the right direction. God's blessings are on them for sure. I see both sets of parents gave their blessings...They chose to honor their Parents...One of God's commandment. So sweet. Following the commandments is no guarantee that life will be a bed of roses or "blessings". Bad stuff happens to good people, all the time- no matter how sweet they are. Do U know that Mickey Mouse was created, November 18, 1928!!!!!! Wonder what that pin is on Jeremy's lapel. What organization is he in? Anyone? It says something like "G 1" or G with another number above it. Jinger is wearing one like it in another picture. It is one of those "Time's Up" pins. It says G3. It’s the conference they were at. I’m not familiar with a Times Up pin. What is it? Times Up pins are black and rectangular. Nice try. It's the G3 conference pin. Ellie and Lily, please don't let a bunch of posts go through about the Times Up movement. It's going to lead to a lot of false accusations. 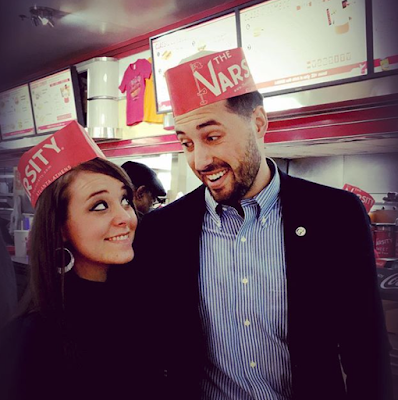 This post is about the Pastor Jeremy and Jinger having a nice time at The Varsity. I live in Atl! Can't believe I missed Jinger and Jeremy. The Varsity is an iconic restaurant when you are doing anything downtown, especially going to a Braves game. Although the Braves stadium just moved so not so much anymore. They serve hot dogs and hamburgers, French fries and onion rings and their orange drink is famous! You have to be careful if you aren't used to such cheap food or else as soon as it hits your stomach you are ready for the bathroom! Oooh I would lovvee their food! Hot dogs n fries n orange drink oh my! All American food! I'm way up in ND though. No! But what does Mickey Mouse have to do with anything here? Cute! Couple. When is Jinger dew? A possible intent for this picture was to capture the name of the restaurant in a creative, cute way! Maybe not, but it is still cute!